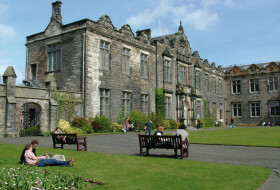 I was a member of the first class of the Joint Degree Programme with the University of St Andrews, majoring in English. I took advantage of my location to indulge in the traditional Scottish music, which I played on the fiddle for 12 years. I was a member of the William & Mary Symphony Orchestra and continued playing classically with the St Andrews Orchestra, as well as continued sailing, as I did at W&M. I plan to attend law school after my somewhat eclectic undergraduate education to study environmental law.